Beautiful Vintage 3BR Full Log Cabin ~ Large Wood-Burning Fireplace, Flat Screen TV and Open Floor Plan overlooking Lake Granby and the Continental Divide. Less than 10 minutes from Rocky Mountain National Park. Great for Family Gatherings with 2 Queen beds, 1 Full bed, 1 Queen hide-a-bed, and 2 Folding Cots. Get Cozy by the Fire or Ski, Hike, Snowshoe, Snowmobile, Fish, ATV, Kayak, Golf. Grab the shuttle in Granby to Winter Park or Mary Jane ski resort or take the family to Sol Vista. Hot Sulphur Springs Spa is nearby too. Mix Business with Pleasure using our Wireless High Speed Internet. Over 150 Miles of Trails for ATV and Snowmobiles are near by ~ Snowmobile Capital of Colorado! Convenience when you arrive from hair dryer and toiletries to coffee and condiments so you don't have to rush to the store. Zen qualities ~ Yoga mat, blanket provided. Rates range depending on the time of year. Winter (2 nt min). Summer (4 nt min) See rate schedule or book online. There is a one time $100 cleaning fee per visit.. Relax, Refresh, Renew, Reacquaint yourself with You and Your Family! Peaceful and quiet yet available activities abound at the nearby Marinas, RMNP and Grand Lake. Ski, Snowshoe, Sled, Snowmobile, Boat, Fish, Relax, Hike, Explore, Stargaze and so much more. Views to die for! Big picture windows in the large living and dining room to view Lake Granby, Byers Peak,Continental Divide and wildlife from within this cozy cabin. Lake and mountain views from kitchen, and 2 front bedrooms, on the deck or in the hammock! Nice wooded view from the 3rd bedroom. Large original brick wood burning fireplace. Outdoor Firepit in Summer and Fall. This full log cabin is a ranch style. It is all one level. Great for family gatherings-- from grandparents that might need to use a walker all the way to the little ones. Very easy access on well maintained, short, straight dead end road.-Peaceful all seasons. Our wooded lot has many healthy log pole pines with a large variety of natural alpine vegetation and flowers that seem to change weekly in the summer months. Views of aspen as well. Catch a glimpse of a stunning Alpenglow on the Continental Divide just before sunset! No city lights, Nature's lights-the stars and Milky Way. 3 minute walk to Beacon Landing Marina and Lake Granby. Boat rentals are available at Beacon Landing Marina. Beacon Landing can launch your own boat or go to nearby Stillwater boat launch for launching your own sail or power boat. From our cabin you can walk from Lake Granby to the Fishing/ Pumping Canal all the way to Shadow Mountain Reservoir. For the hardy hikers, you can continue across the dam at the Headwaters of the Colorado River and hike the Shadow Mountain Trail into Grand Lake. A pleasant 5 mile rolling hills bike ride into the quaint downtown of Grand Lake. Grand Lake is known for its boardwalk and spectacular Fourth of July fireworks display on the lake with the mountains in the background. It is also know for its “Midnight Madness” New Year’s Eve fireworks display. They have lots of weekend activities all year long. Grand Lake is “the snowmobiling capital of Colorado.” This area has 150 miles of the best snowmobiling trails in North America according several magazines. Lake Granby has awesome winter fishing tournaments. One tournament often offers a new pick-up truck as first prize! 3 minute walk to the fishing tournament on Lake Granby. Great fishing year round! We get lots of sunshine even in the winter. There are many 4WD trails near our cabin in nearby Arapahoe National Forest and other areas too. Just 5 miles south of Rocky Mountain National Park. The west entrance Kawuneeche Visitor Center stays open year round with programs and activities each season. Trail Ridge Road from the west side of the park to the east side is generally open from Memorial Day through the end of October. It varies with the weather however. Elk rut and bugle in the fall. Snowshoeing hikes in the winter. Summer trails, hiking, horseback riding, and wildflowers. Spring animals emerge with their young. Three Public Golf Courses nearby: Grand Lake Golf Course and Touring Center, 18 R, Pole Creek Golf Club, 27 R, public Headwaters Golf Course, 18 R, public Orvis has a Golf Course currently under construction. Minutes from 3 downhill ski resorts: Sol Vista Ski Resort, Winter Park Ski Resort, Mary Jane Ski Resort as well as Hot Sulphur Springs Spa. Travel to these resorts from our cabin on scenic noncongested well cleared county roads. Also close to groomed Cross Country Skiing and Snowshoeing, Rocky Mtn. National Park, Snow Mountain Ranch YMCA of the Rockies, Devil’s Thumb Cross Country Ski Area, Hot Sulfur Springs, Grand Lake Touring Center features a Full Moon Ski to a bonfire in January and February. You can snowshoe and cross country ski as well as ATV and Snowmobile right from the cabin for free, of course you can hike too! 3 bedrooms. The front 2 bedrooms (the Lighthouse Room and the Western Room) face the lake. The Lighthouse Room has a queen size bed. The master bedroom has a queen size bed also. The living room also has a queen size hide-a-bed. 1 full bath. Kitchen has a breakfast bar and the same great views of Lake Granby and Byers Peak along with the Continental Divide. Completely new mattress sets as of July 11, 2014. Updated kitchen and hall wood floors in 2013. Starry, starry nights are here! Moose, fox, elk and great horned owls like our natural surroundings and wander on our land. Eagles and Osprey soar overhead often. Ruby throated hummingbirds and Rufus hummingbirds abound! This is our future retirement home and current get away. No abuse of the property or beautiful surroundings will be tolerated. We invite you to leave your cares behind and come enjoy the charm of a rustic full log cabin in an outstanding location. I can give you many of Options to get to our cabin- plane, train or car. Beverly is a retired Elementary School teacher. She taught Vocal Music, Kdgn, 3rd grade and Elementary Science. She is a nature enthusiast and enjoys going to schools in Colorado to teach the students and teachers about sea turtles and how we in Colorado affect the oceans. She is an advisor to Colorado Ocean Coalition, a non profit. Craig is a small business owner. Both Craig and Beverly take pleasure knowing visiting families are reconnecting when they get together and enjoy their wonderful real mountain lake log cabin. They have a wonderfully expanding family as their 4 grown children get married and have children of their own. Craig is also a singer/songwriter on guitar. They have a rescued little Chug...chihuahua/pug. We were looking for a sailboat when we happened upon this wonderful old log cabin that had just been listed for sale. We couldn't resist the view of the Continental Divide, the proximity to Lake Granby, the wonderful natural vegetative lot, the log cabin's room layout and large red brick wood burning fireplace! It reminded us of the Lincoln Log cabins we built as children. Craig and I turned to each other and said, 'We need to put an offer on this.' We did, and the rest is history! We love that our log cabin is a 'real' vintage full log cabin and has all the character that goes with it, yet it has modern conveniences. All natural vegetation (like RMNP) surroundings on our property that goes from the dirt road in the front to the dead road in the back of our cabin. Lots of wildflowers and shrubs and wildlife too. We love to ski at Winter Park and Mary Jane and drive back to the cabin in no time with no traffic--all the traffic is going in the other direction toward Denver! We also enjoy the nearness of all the year round special activities the Town of Grand Lake has like the Winter Carnival, Buffalo Weekend, Arts & Crafts, Antique Wooden Boat show, Fall Festival and Fireworks on the 4th of July and again on New Year's Eve, but are so happy to be able to leave the hub-bub and drive 4 miles away to our peaceful dead end street looking out at the wildlife, lake and Rocky Mountains. We enjoy the full moon cross country ski at Grand Lake Touring Center in January and February. We enjoy cross-country skiing there during the day as they even have a trail where a person can cross country ski with their dogs--our grand-dog, Loki, loves to do that! We enjoy lying on the hammock day and night, relaxing or stargazing even if we have to get bundled up! We love to go to Rocky Mountain National Park and take their free guided hikes and things like photography classes. In the winter, we like to explore the trails on our snowshoes too. In the fall hearing the elk bugling is very special. We love it when the aspen trees turn gold in front of our cabin in the fall. Too much to tell. Very, very serene and peaceful. Bev's favorite place on earth is here at this cabin. She has read that the best Feng Shui is on a mountain near a lake, maybe that explains it. Great Rocky Mountain water from the tap and fresh air to breath in! There is even a yoga studio about a mile away, but I do keep a yoga mat for guests and my own use at the cabin. 'HEAVEN!' as one guest put it. See beautiful, large Lake Granby from its scenic northshore from inside and outside the cabin. .3 miles from Beacon Landing Marina. It is about 3 minute walk down to the lake. See gorgeous views of the Continental Divide, Byers Peak and National Forest from inside and outside the cabin. Flannel sheets, warm blankets and a soft, warm robe is provided in each bedroom. Fluffy towels, a hair dryer, toilet paper, guest shampoo and soap is provided in the bathroom. We provide kitchen hand towels, hot pads, aprons as well as paper towels and dishwasher detergent and dishwashing liquid in the kitchen. There is no washing machine on the property, but our cleaning service will provide a pick up and drop off laundry service. Just let Beverly know your needs. There is no clothes dryer on the property but our cleaning service will provide a pick up and drop off laundry service. Just let Beverly know you needs. There is parking for cars and or a boat on a trailer or snowmobiles on a trailer. an assortment of towels for bathing are provided, but no beach, boating or snowmobile cleaning towels. Yoga mat and blanket is provided. Also yoga tapes. 10# dumb bells are provided as well. There is a yoga studio about a mile away also. We call the living room the Great Room. 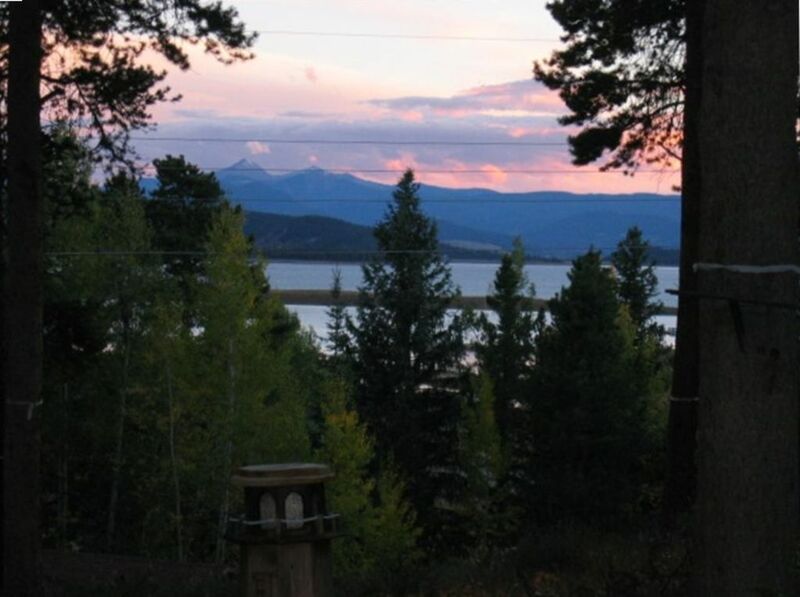 It is 23' x 25' and has amazing views of the lake and the Continental Divide. The dishwasher is a portable diswasher that wheels to the kitchen sink. lots of small appliances available for your use. Starter coffee, and condiments are provided as well as Microwave, coffee maker, cast iron fry pans, crock pot, waffle iron, food processor, roasting pan, cookie sheets, breadmaker, fondue pot,George Foreman grill, pitchers, casserole dishes and more! A large variety for children as well as adults. Great views from the outdoor log couch, loveseat and rustic metal chairs. Golf is nearby in Grand Lake and also in Granby. At least 4 courses that I am aware of. There are some limitations for wheelchairs. There is a heated pool that can be used for a nominal fee in the Town of Grand Lake at a hotel. Housekeeping Service is available upon request for an additional charge . Free Iron and Small Ironing Board, Free Yoga Mat and blanket provided, Free Yoga VHS tape, Free 10# dumb bells, Pilates VHS tapes, Piano Keyboard, Acoustic Guitar in the cabin. Vintage Style Camp Fire Stools provided as well as low seat beach chairs. In the Spring, Summer and Fall there is a hammock and also a swing glider available. The air is clean and pure. The cabin offers peace and solitude. We especially loved the great room and fireplace. We are so glad you enjoyed our cabin. It is a winter wonderland! We look forward to your return. Great cabin with excellent views of Lake Granby. Easy access to Grand Lake and Rocky Mountain National Park. Bev was very responsive and easy to work with. The cabin was well kept and well appointed. The notes on thermostats, kitchen cabinets etc. were most helpful. I had several email contact with the property owner and all were friendly and helpful. We especially enjoyed the games and the early mornings on the deck (chilly but lovely). We all agreed that we would return in the future. Good memories and many wonderful photos will be treasured for a long time. We are so glad you all enjoyed it! Thanks for the cute note you left on the fridge! We hope you do come again, it is wonderful in every season. Our family had a great time, enjoyed the area. The cabin was perfect for the 6 of us. Thank you! We are so glad it worked out for all 6 of you! Come back anytime! Really enjoyed our stay. We rented many cabins in the past and this one is tops. Great views, awesome great room and minutes from Rocky Mountain National Park and many other activities. So glad you enjoyed it! You are welcome back any time of the year! The stay was very pleasant. Our kids loved it! We will definitely refer friends. We are so glad you enjoyed our log cabin and that your kids loved it! It is one of very few authentic rental log cabins around... especially with our view and location. We rent it all year long with no need for a 4x4 on our dead end dirt road. Thank you so much for referring it to your friends. We are about an 8 minute drive to Rocky Mountain National Park. We are a short drive to Adams Falls and many other trails. Great views of the Continental Divide, Arapahoe National Forest, Great star gazing & see the Milky Way at night. There is a wheelchair accessible park about 5 miles away on the water with amazing views as well as lake fishing from a wheel chair. About 30 minutes to Hot Sulfur Springs Spa. Over 150 miles of snowmobiling and 4 WD ATV trails, Snowshoeing (see Rocky Mtn. Natl Park Jan & Feb Schedule for snowshoeing and cross country skiing), Winter horse drawn sleigh rides, Tubing Hill. Lots of festivals in Grand Lake and Granby during the Summer, Fall and Winter.